The small blue dot in the upper-right corner is Earth. The Sun, also known by the Latin name Sol is a yellow dwarf star of spectral type G2V. The eight planets, including Earth, orbit the sun, as do countless other objects. The sun a classified as spectral class G2V. The "G" means it is a moderately warm yellow star. The "2" means it is in the third hottest group of stars within type "G" (the scale runs from 0 to 9). The "V" is a Roman numeral for 5 and indicates the Sun's size. A size V star is a dwarf, main sequence star. The sun is in the 95th percentile in its class by size and mass of other stars in its immediate region. This took place during the fourth day of Creation Week. More to the point, the sun is a part of God's creation, not a "god" in its own right. In contrast, virtually every other civilization has regarded the sun as one of many gods, a position that is not hard to understand given it's intended role and it's prominence in the daytime sky. The Egyptians called the sun Ra or Re, a deity who, they said, created the world. The Egyptians also called the sun-disk Aten, and for a brief period (during the reign of Pharaoh Amenhotep IV or Akhenaten), actually worshipped Aten as the one and only god of the universe. In Babylonia and Assyria the sun was called Shamash, a god who, because he could see everything happening on earth, was also associated with truth and justice. The Greeks at first regarded Helios as a son of heaven and earth but later came to associate the sun with their god of truth, Apollo. According to the Apache Creation Story, Creator, the One Who Lives Above, created the sun by singing it into existence after he had created the Girl-Without-Parents. The most common theme in all the sun-worship cults is the association of the sun with truth and justice personified. The second most common theme is the regarding of the sun as the creator. According to the materialist and uniformitarian view, what eventually became the solar system initially existed as a large, rotating cloud of dust and gas, composed of hydrogen and helium produced in the Big Bang as well as small amounts of heavier elements. Around 4.57 billion years ago, the cloud began to contract, perhaps as a result of a shock wave from a nearby supernova. Inertia caused the rotating cloud to flatten into a disk. Most of the mass concentrated in the middle, and began to heat up. Eventually, the kinetic energy of the hydrogen was sufficient to overcome the electromagnetic repulsion between the protons, and fusion began. The resulting solar wind helped clear away much of the material which had not coalesced into planets or other orbiting bodies. The Sun is most likely a third-generation star, meaning it is in the latest generation. Eventually, in a few billion years the sun will have expended most of its hydrogen, causing the outer shell to push outward and cool, turning into a red giant, and helium begins to be fused into carbon. At this stage, Venus and Mercury will have been consumed by the now red giant star, and possibly earth as well. Once the helium has been fused into carbon, there will not be enough heat to continue fusion to even heavier elements (as in larger stars), the core will collapse and the outer shell will be pushed off and form a planetary nebula, with a white dwarf, and eventually a black dwarf at its heart. The sun orbits the galactic center at a distance less than half the total estimated radius of the galaxy, and in an orbit inclined about 25° from the galactic plane. The eccentricity of the sun's orbit is 0.07, about average in comparison to the eccentricities of the planets and dwarf planets of the solar system. At present the sun lies 50 light years north of the galactic plane and is continuing to climb north of it as it approaches perigalacticon. The sun accounts for 99.8% of our solar system's total mass. With a mass of 2 x 1030 kg, an atmospheric temperature of about 5800 K, and a luminosity of 4x1020 megawatts, the sun is by far the most extraordinary object during the day-time sky and of our solar system. However within our Milky Way galaxy it is one of probably 100 billion of the same types of stars. By mass, it is composed of 72% hydrogen, 26% helium and 2% trace elements, mostly oxygen, carbon, neon, nitrogen, magnesium, iron, and silicon. Core temperatures reach 15,000,000 K (K = Kelvin) while the sun's surface or photosphere temperature is 5,800 K. When the photosphere is hit by the heat of the sun the temperature drops to a minimum of 4,000 K. It then continues further until it encounters a thin layer of atmosphere roughly 10,000 kilometers deep called the chromosphere and reverses trend to rise to 8,000 K. Even further is another part of the sun's total atmosphere called the corona that blends in with interplanetary space. The sun produces a vast amount of energy, only a tiny fraction of which the Earth receives, yet this small amount powers practically all life (and industry) on Earth, either directly or indirectly. It is also the main force controlling Earth's climate and weather. Plants and other organisms capture the energy of the sun in a process called photosynthesis. Animals and other heterotrophs obtain food and energy from consuming plants or from consuming animals which have consumed the plants. Only a few microscopic organisms obtain energy directly from chemical reactions. The tremendous light and heat that the sun releases, and the delicate position that the Earth occupies in relation to the sun, combine to make the sun an integral part of sustaining life. Human civilization, too, is dependent on the sun. Much of humanity's industrial energy needs are obtained through the combustion of fossil fuels, the remains of dead plants and animals. Uneven heating of the atmosphere provides wind power. Also, the sun evaporates water from lower-lying bodies of water; this then falls as rain and flows back down channels, providing hydroelectric power. On a limited basis, solar power is directly utilized. Geothermal energy and nuclear energy are examples of energy sources to which the Sun does not directly contribute. The sun produces its energy through nuclear fusion. The favored model for energy production relies on tremendous pressures resulting from the Sun's own mass to overcome the natural electrostatic repulsive forces that normally keep hydrogen nuclei from coming together and fusing. Here, represents an electron, H means hydrogen, He means helium, represents a gamma photon, represents a small, uncharged particle called a neutrino that is not supposed to have any proper mass, and the energy unit eV, or electron volt, is the product of the charge on a single electron and the standard unit of electromotive force or electromotive potential. The energy produced varies as the fourth power of the temperature—and at the temperatures thought to prevail in the sun's core, matter exists, not as ordinary matter with atomic nuclei and electrons, but as plasma—a form of super-hot matter in which atoms are totally denuded of their electrons. The first equation above is assumed to be the rate-limiting step. The neutrinos produced should have an energy of 0.26 MeV—too little energy to be detectable by current technology. But processes occurring after this step ought to produce higher-energy neutrinos that would be detectable. Such neutrinos have been detected, but at a flux much smaller than predicted. This indicates that the presumed rates for these subsequent processes are higher than the true rates, or else the neutrinos produced somehow transform to a different type of neutrino that would be unobservable. That in turn would imply that neutrinos do have rest mass. According to current models, some of this energy is transferred to the surface by convection in the outer 20-30% of the body of the sun. Helium in this convective zone rises to or near the surface, releases its heat, and then sinks back to the center. Helium absorbs radiation more readily than does hydrogen, and for that reason the Sun is always getting marginally brighter with the passage of time. The remaining energy is transferred in the gamma photons, which must take a "random walk" to reach the corona of the sun. Current models suggest that the light generated by these processes takes 50 million years to reach the surface. The earliest observations of sunspots might have been made in the fourth century BC by the Greeks. Chinese astronomical records dating back to 28 BC include descriptions of changing dark patches on the Sun that might have been sunspots. Galileo Galilei in 1613 was the first astronomer to study sunspots in any detail. It was a revolutionary observation, and one that clashed greatly with Western man's ideas of the heavens, propounded chiefly by Aristotle, as a perfect, unblemished place. An amateur astronomer, Heinrich Schwabe, was the first to note the sunspot cycle in 1843. The sunspots are dark on account of their cooler temperature. This in turn is due to strong magnetic fields which allow the transport of heat via convective motion in the sun. At times these sunspots can be 50,000 miles in diameter and appear in two bands, one being north and the other south in the direction of the sun's equator. Observations have also shown that the number and location of sunspots come and go in a semi-periodic 9.5 to 11-year solar cycles. At the start of this cycle they are about 30 degrees from the equator. Midway through, the cycle of the number of sunspots observed is maximum, usually about 15 degrees from the equator. Near the end of this on average 10.8-year cycle, the sunspots are very near the equator. The magnetosphere oscillates in synchrony with the sunspots in a twenty-two-year cycle. The current amplitude of that cycle is 3.5 × 1029 N-m-T. This amplitude has been decaying since creation, but relatively slowly, with a half-life of 13,170 Julian years. 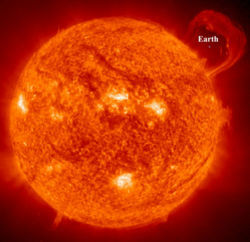 In fact, according to Humphreys, the sun's magnetic field has lost perhaps 25 percent of its strength since creation. Measurements of the sun's magnetic dipole moment have not been exact enough to demonstrate whether the amplitude of the field's oscillations is constant or decaying. If those oscillations are in fact decaying, then the Sun cannot be a dynamo. Uniformitarians have also had to admit that the sun rotates about 200 times more slowly than the nebula hypothesis would predict, simply on account of the contraction of the solar mass into its present volume. This violates of the Law of Conservation of Angular Momentum. This angular momentum problem has been apparent for hundreds of years and remains unresolved to this day. The sun's equatorial plane is inclined 7.25° to the ecliptic. (See Earth.) By the nebula hypothesis, that inclination should be zero. The errant inclination poses an especially acute problem for the orbit of Neptune. Uniformitarians have speculated that a collision with an even larger object knocked the sun off a true perpendicular to its present inclination—but no scientist has offered a convincing speculation as to what that object might be. Conventional astronomers, Carl Sagan among them, insist that our star is mediocre and unremarkable. Yet the G-type of star is relatively rare, and furthermore its mass and position in the galaxy lie within very narrow tolerances for the support of life. The sun is also a singular star, not part of a binary—also a rare finding—and is remarkably stable in its energy output. These facts combine to make the sun an unusually hospitable star for a planet to have life on it. ↑ Trapp, Andrew. "Timescales in Open, Flat, and Very Large Closed Universes." From Now Until the End of Time... Accessed January 17, 2008. ↑ 2.0 2.1 Author unknown. "Entry for 'Apogalacticon'." <http://everything2.com/> July 22, 2001. Accessed January 17, 2008. ↑ 4.0 4.1 4.2 4.3 4.4 4.5 4.6 Williams, David R. "Sun Fact Sheet." Goddard Space Flight Center (NASA), September 1, 2004. Accessed January 17, 2008. ↑ 5.0 5.1 5.2 5.3 5.4 5.5 5.6 5.7 Harvey, Samantha. "Sun Facts and Figures." NASA, April 26, 2007. Accessed January 17, 2008. ↑ This day is actually a synodic day and is the period for the same point on the Sun's equator to appear again directly facing the Earth. ↑ 7.0 7.1 7.2 7.3 7.4 7.5 7.6 7.7 "Entry for 'Sun'." Encyclopædia Britannica, 2008. Encyclopædia Britannica Online. Accessed March 5, 2008. ↑ 8.0 8.1 8.2 8.3 8.4 Humphreys, D. R. "The Creation of Planetary Magnetic Fields." Creation Research Society Quarterly 21(3), December 1984. Accessed April 29, 2008. ↑ Dunn, Jimmy. "Re (Ra) and Re-Horakhty." <http://www.touregypt.net/>. Accessed March 5, 2008. ↑ Dunn, Jimmy. "The Egyptian God Aten Before and After Akhenaten." <http://www.touregypt.net/>. Accessed March 5, 2008. ↑ Welker, Glenn. "Apache Creation Story" <Indians.org>, August 12, 2004. Accessed March 6, 2008. ↑ "Cosmic Evolution, Epoch 4: Planetary Evolution." Cosmic Evolution: From Big Bang to Humankind, Wright Center, Tufts University. Accessed March 6, 2008. ↑ LeDrew, Glenn. "Our Galactic Home." AstroNotes, 1997. Accessed January 17, 2008. ↑ 18.0 18.1 18.2 "Sunspots: Modern Research, Page 2." The Exploratorium, 1998. Accessed March 5, 2008. ↑ 19.0 19.1 "Sunspots: History." The Exploratorium, 1998. Accessed March 5, 2008. ↑ Paul describes a region called the "third heaven" as the actual "heaven" where God has His throne. See II_Corinthians 12:2 . But the Bible was not yet readily available to laymen in Galileo's day, and Western man might naturally confuse God's heaven with the lesser "heaven" that we call "outer space" today. ↑ "The Sunspot Cycle." The Exploratorium, 1998. Accessed March 5, 2008. ↑ "The Sun." Curious about Astronomy? Ask an Astronomer, Cornell University, October 18, 2007. Accessed March 5, 2008. ↑ "Factors Affecting Global Temperature." Ponder the Maunder. Accessed March 5, 2008. ↑ 24.0 24.1 24.2 24.3 24.4 Psarris, Spike. Our Created Universe. Seattle Creation Conference, 2007. Video presentation, 55 minutes. ↑ Eddy, John. Remarks at a seminar reported in Geotimes, 23:18, September, 1978. Quoted in Pierce, Larry, "The Forgotten Archbishop", in James Ussher, The Annals of the World, Larry Pierce, ed., Green Forest, AR: Master Books, 2003 (ISBN 0890513600), pp. 891-2. This page was last modified on 26 September 2018, at 15:30. This page has been accessed 36,745 times.